The buzz heralding the forthcoming set from Philadelphia's Heyward Howkins inexorably balloons, at least regionally, growing larger and larger in the frame like an oncoming train, and for good reason: the former The Trouble With Sweeney guitarist's debut solo set is as singular a collection of deconstructed chamber pop as we've heard this year. The Hale & Hearty is 11 cinematic songs that calculate a musical mean somewhere between certain work of Bills Frisell and Bonnie "Prince." The serene record asks the small favor of an open mind from fans of contemporary indie rock, but that favor is paid back many times over with boundary-challenging compositions, deft arrangements and remarkably whole lyrical ideas. Heyward Howkins' family roots stretch back through the history of Philadelphia at least as far as the signing of The Declaration of Independence, which document was signed by Howkins' great-great-you-get-the-picture-grandfather, and his family history underpins many of the narratives found on The Hale & Hearty. That said, our favorite jam is apparently about the last two birds on earth -- we'll return to that later. It is easy to discern a contrast between Mr. Howkins' work now and that of The Trouble With Sweeney, as the latter band's relatively formal structures seem rigid when held up to his more expositive yet remarkably spare solo work (and a digression: for the record the three best The Trouble With Sweeney jams are as follows: "That's What I Was Wearing That Day;" "The Snitch;" "Evelyn Rochman"). 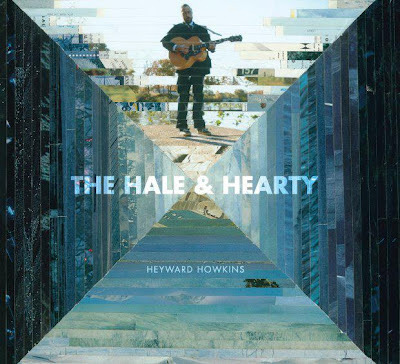 By contrast, Howkins' music contains a lot of space, a lot of it, around which he has artfully arranged intricate guitars, unexpectedly imaginative drumming, beautiful and gentle vocals (including those of former Mendoza Line co-fronter Shannon McArdle) and occasional horn, strings and keys. It's an album with a weathered journalist's facility for relating detail, an album that brims with surprises, from the percussive shout in "The Raucous Calls Of Morning" (we suppose the title should have provided us some warning) to the brief outbreak of a gentle disco groove in "Flash Mob." The Hale & Hearty sounds like a radio transmission from a bygone and unrealized future imagined by an even more remote past. It sounds like Philadelphia. The highlight of the collection is the quiet, impressionist curiosity "Plume And Orange," whose introduction twins Mr. Howkins' slap-backed but unfettered tenor with a skeletal guitar melody. What follows is a succession of dazzling sections -- set off with little regard for what might be a verse and what might be a chorus -- accented by more delightfully understated guitar work, staccato Steve Nieve-styled organ, and the most forthright rhythm tracks on the collection. We've listened to the song scores of times and it steal reveals itself a little more every time, like slow motion footage of flowers opening to sunlight. Howkins was gracious enough to let us offer the song as a stream and download below, which we do with our highest recommendation. To hear an alternate version of the song, check out this YouTube video. The Hale & Hearty is out June 26, and you can pre-order it right here. The album is being feted this Saturday night in Philadelphia (four blocks north of our old stomping grounds) with a record-release show, the details of which are right here.